As the manufacturing landscape changes with the advent of Industry 4.0, so too will workers’ roles on the factory floor. With billions of IoT-connected components already contributing towards greater levels of efficiency in factories around the globe, manufacturers will need more people with technological expertise, triggering a rise in upskilling – something which is already taking place across the industry. While the core skillsets of workers evolve in-line with developments within the industry, significant changes to workers’ roles are nothing new. As recently as the 1990s, manufacturing began to adopt automation in applications such as robotic welding in the automotive industry. But jobs didn’t disappear as a result, rather, people evolved and competences began to change. Now, as the factory of the future transforms the industrial landscape, we will see a greater shift towards digital skills in the workforce. With the presence of artificial intelligence (AI) increasing significantly in factories, it’s crucial for humans to work hand-in-hand with the new technology which surrounds them. In essence, collaboration is key. According to recent research from Gartner, one in five employees in ‘non-routine’ work roles will rely in some way on AI by 2022, while an additional two million jobs will be created by 2025 as a direct result of AI. So rather than detracting from the role humans play in manufacturing, AI will support them to take on new roles, ultimately creating more opportunity for employees than it will eliminate. In the view of Lina Huertas, Head of Technology Strategy for Digital Manufacturing at the Manufacturing Technology Centre (MTC), these changes in manufacturing – and the roles of workers – could ultimately make a genuinely positive impact on society. Pointing to the bottom-up thinking that the MTC is seeing in some emerging markets, Lina said: “They’re looking at these developments in terms not just of technology but of society, of their implications for social prosperity and cohesion. These markets recognise that in order to pursue these developments they need to make preparations, and in particular to ensure not just that they develop new skills, but that they retain vital older ones. They see that upskilling and training need to happen alongside technological investment. It’s a good rule for everyone, really”. Ultimately, the Factory of the Future is about evolution. As we’ve seen in decades gone by, things change – technology is developed to help us reach new heights, and people adapt to those changes when playing their part in that evolutionary cycle. 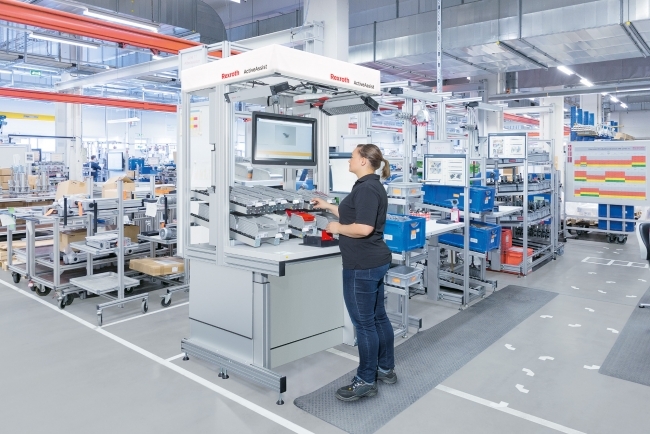 For Bosch Rexroth – and manufacturers the world over – facilitating change allows us to retain the skills we’ve developed and extended the ability of workforces as we look to work more smartly and deliver greater levels of efficiency, productivity and profitability for every one of our customers. The thing to remember: the Factory of the Future isn’t a revolution, but evolution.